New duo, Surebert and Landon Wordswell, release their first official single from their forthcoming album, The Numbers Game. The first single not only shares the same name as the album, but it also shares the same spirit throughout. Lyrically speaking, Landon drew inspiration for the album in the midst of thumbing through the critically acclaimed book, “The New Jim Crow”, penned by none other than Michelle Alexander. The emcee has been quoted at shows nightly on tour stating the importance of her influence throughout the upcoming album. Conceptually the album will relatably give listeners from all walks of life a personal view into the many other stories directly impacted by “The Numbers Game”. The duo reached out to Michael Bernier to bring in a subtle reggae touch throughout the track. 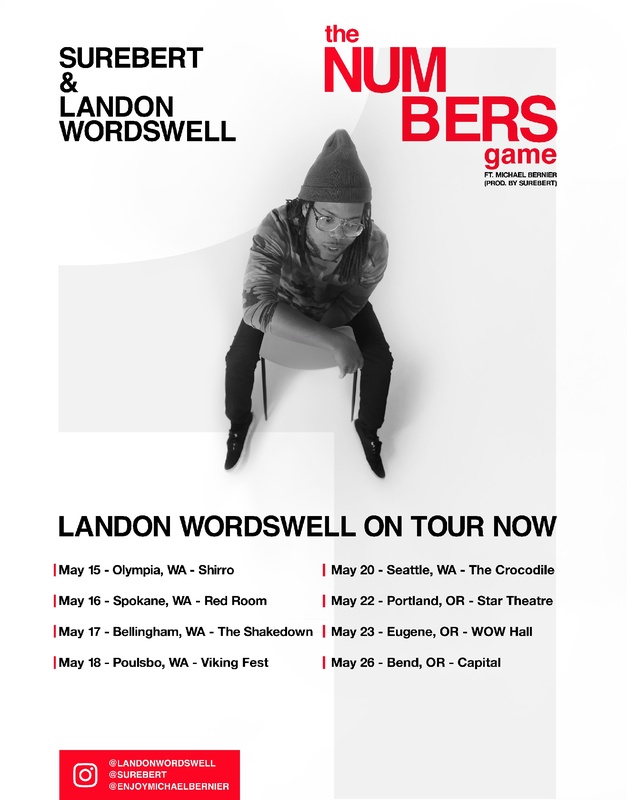 Landon Worsdwell has been on the road since February 4 with the likes of Talib Kweli for a portion of it and Skyzoo for another. Landon seems to always be in good company as a frequent tour partner of Blackalicious’ own Gift of Gab. This year seems to be a continual string of successes for the young emcee stemming from last years runs with The Legendary Artifacts on a European run as well as a tour run with One Be Lo (Binary Star). The emcee has his sights set on embarking on international travel even more this and the following year to push for the new Surebert laced full-length Album. The Numbers Game is a Dual Project fully produced by Surebert (Portland, OR) and mixed and mastered by Landon’s trusted team of Carl Roe and D-Sane of Seattle, WA.